Channel Nine will again host the annual Oscars ceremony in Australia. 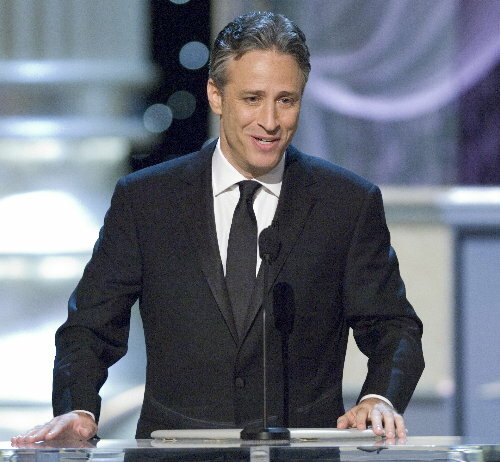 The 80th Academy Awards, to be hosted by Jon Stewart, will air at 8:30pm Monday February 25. The delayed telecast will include red carpet arrivals hosted again by Richard Wilkins. This has previously been packaged as a separate show by Nine, but this year incorporates part of the three hour event. Nine’s Oscar telecast follows A Year with the Royal Family at 7:30pm, narrated by Cate Blanchett who is nominated for two awards. Join host Jon Stewart for the 80th Annual Academy Awards from the Kodak Theatre in Hollywood. Up for nomination is Australia’s own Cate Blanchett for her roles in “Elizabeth II: The Golden Age” and her portrayal of Bob Dylan in “I’m Not There”. Richard Wilkins hosts the Red Carpet Arrivals before the award ceremony to give us a close look at the glitz and glamour of the celebrities as they arrive. Wilkins has got some incriminating photos of someone! richard wilkins is a cool dude and knows the entertainment business better then anyone that’s why 🙂 great choice having john stewart host the awards. what does richard wilkins have on the powers that be at channel nine that he’s continually allowed to add NOTHING to the oscars year after year? what are they going to edit out of the show to make room for his inane questions? and why make us wait until 8:30?